Larry Gotkin’s custom, handmade items offer museum-quality, artisan craftsmanship for the serious collector or re-enactor. He produces unique knives, edged weapons, powderhorns, tomahawks, war clubs, jewelry, metal sculpture, candle holders, cribbage boards, chess sets, flint & obsidian knives, Japanese swords, kitchen knives, cheese slicers, desk knives, menorahs. Creative architecture, tenant improvements, and more. Share this Site: Museum-quality custom handmade knives, tomahawks, edged weapons, war clubs, powder horns, powderhorns, metal sculpture, jewelry by Larry Gotkin for Sale or Commission. In Stock Items: Simply go to the page for the item you want to order, then click the BUY NOW button to send Larry an email message. Commissioned Custom Handmade Items: Don't see what you want? Larry Gotkin can custom create almost any piece for you on a commission basis. No International Orders: We apologize, but due to high shipping and customs costs, and exorbitant bank and currency conversion fees, we are no longer accepting international orders, INCLUDING CANADA. I started doing scrimshaw as a hobby in 1979. Knives, jewelry, and firearms were excellent canvases for this new hobby, so I began to rehandle knives and firearms and sell them locally. The problem with any crafts hobby is that you soon run out of room in your own house to display pieces, and I cannot afford to give them ALL away as gifts! Thus, the birth of this website. Over the years, I have used several blade suppliers including House of Muzzleloading, Texas Knifemakers Supplies, Kris Cutlery, and others, modifying them as required. In 2009, I began forging some, mostly historical, blades of my own. The forged blades are noted as such in the descriptions on this website. I also have been collaborating with a local bladesmith, Uhrs Chantell (bladesbychntell@gmail.com). He beats the iron and I handle and sheath the resulting blades. The Magua tomahawk and Magua knife are samples of our collaboration. My latest passions are hand-forged metal sculptures and knives, along with powderhorns and warclubs! 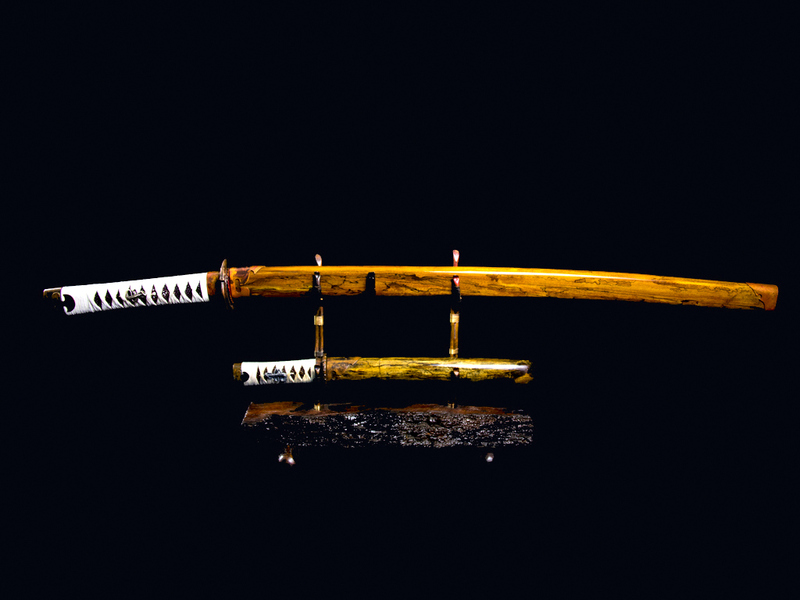 Please note that katanas and wakisashis can be made to order to match the tantos to make a complete daisho. The cribbage boards, chess sets, jewelry, and Jewish religious objects illustrate the breadth of my work.